The selections are not necessarily the 'greatest films of all time,' or the most favorite, or the ones that were best reviewed by critics or fans, but those which were major milestones in the development of US film-making. The films are also not ranked, but organized by decade. There is considerable discussion about each's one's historical context. From silents to modern films, these are the exemplary films that transformed US film-making, and had the most impact. They are not necessarily the most successful films (at the box-office), or the ones with the most Oscar nominations (or awards), but those factors do play some role in a film's influence and importance. One can measure a film's long term lasting influence or significance by understanding how many times a film has been reverentially referenced in other subsequent movies. 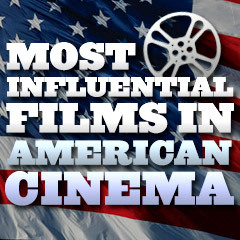 Other factors include a movie's influence on the popular culture, and/or its advancements in filmmaking and storytelling that brought changes to the future of cinema.